It is my theory that if students who are invested in their natural environments are given the tools and balanced information about decisions directly impacting their immediate natural environment, they will take action to save it. As heirs to this earth, this generation has the responsibility to steward it sustainably. This requires practical experiential knowledge to be able to learn how to take appropriate action to fulfil the responsibility of planetary stewardship. On December 19th, 2013, the National Energy Board of Canada released a two volume, five-textbook-sized review and 209 conditions that the Enbridge oil corporation would have to meet to attain their approval for their proposed Northern Gateway Pipeline to cross through British Columbia, Canada from the Athabasca oil sands in Alberta, Canada. This came out of a lengthy process of reviewing the concerns of the British Colombian people with a non-partisan review panel who took into account the overwhelming backlash from British Colombians against the proposed pipeline by categorizing each of their concerns and reasons for not wanting to have such a development run through our province, to the coast to be taken half way around the world on large super-tankers, into 209 categories with conditions to address (but not requiring to solve) each specific concern or reason. My own moral compass is clearly hard set in favour of this planet, it’s current inhabitants (human and more-than-human), and our future generations, however, it is my firm belief that when learning about anything, especially in the case of young minds, all sides of any issue are fully explored without bias. In this case, it sometimes meant me playing devil’s advocate to make sure all aspects of the issue were covered; but to approach an issue in any other way — in my own view — would be absolutely irresponsible. With the eco club at École K.L.O. Middle School, the students and I (on their own volunteered time) spent two months researching the pro-pipeline side of this issue, the anti-pipeline side of this issue, and the news media perspective on the issue. After getting a very well rounded understanding of what was proposed to directly impact the lives and land those lives are sustained by of British Columbians, each member of the eco club wrote a letter either to the Prime Minister of Canada, Stephen Harper or the Premiere of British Columbia, Christie Clark, with their own concerns and points of view on this proposed pipeline. Unfortunately, within a couple of weeks, each student received an identical letter very carefully addressing every concern regarding the proposed pipeline including points the students hadn’t even made in their letters. Undeterred however, the bold students of the eco club decided to take an alternative approach to making the concerns they have with this proposed pipeline taking away their natural playground and future inheritance. We began working on an eco art sculptural response to this proposed pipeline and the 209 conditions standing between us and environmental disaster. Using the extraneously large two volume document of the 209 conditions themselves, we created a series of five tubes, 30.5cm (1 foot) in diameter, ranging in length from 61cm (2 feet) to 3 meters (10 feet); our own pipeline. 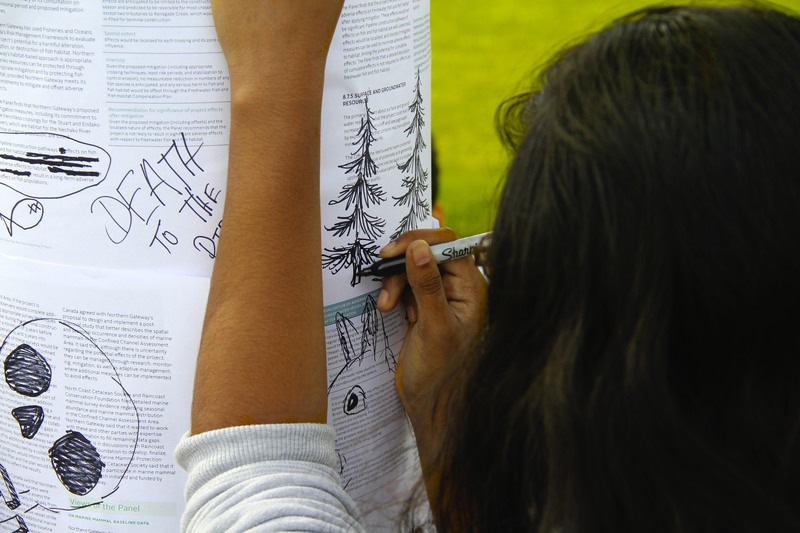 I then got a box of Sharpie markers for the students to use and they began repurposing that pipeline of documents into everything from environmental blackout poetry to graffiti art. These student’s all came away with an understanding of how accessible it is to take action on the decisions being made that directly affect them & have begun talking about possibly taking similar action on other causes as they arise in future. I am filled with hope for our planet’s future because I have seen here that when the heirs of this planet are shown the facts evenly, they lean greatly towards the moral decisions and want to take positive action on that instead of letting disaster strike for the sake of short-term personal gain. This was something they came to on their own long before I made my point of view known to them and it is because of this that I am reaffirmed in not only my own environmental actions but in my conviction that balanced information and well rounded, unbiased knowledge — when shared with others — do good for all. Currently, the eco club students are looking at inviting their peers to join in with the repurposing of these pipeline document tubes over a lunchtime where they will share all sides they have learned about this issue with their peers, so that they they too can make informed decisions, about what they make a public statement about this issue on with this eco art piece.